“’Train shot,’” the bartender shouted at him, pinching a small glass between two nail-bitten fingers. 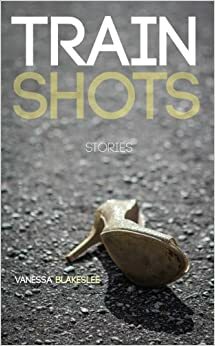 You could devour Vanessa Blakeslee’s first collection of short stories, Train Shots from The Burrow Press Review in one sitting, but that would be like slamming eleven shots in one hot gulp—even with an assortment of short story chasers, the warmth from the last short will burn in your throat. Blakeslee’s fearless debut collection showcases a skilled range because her voice embodies convincingly human characters from all walks of life. Because Train Shots is a short ride, Blakeslee’s collection elicits a tight squeeze on the safety handles most of the way—and you will want to miss your stop just to keep moving.